On the Mediterranean coast, 40 km north of Tel Aviv was a small, sleepy Phoenician town founded about the 3rd C BCE with a modest port called Strato’s Tower. All that changed when Herod chose the site for the development of a large, protected harbor. This boosted trade and commerce (and made a lot of money for Herod) and enabled closer ties with the centers of the Roman empire. Caesarea was a well-planned urban center, a walled city with streets laid out in a grid, warehouses, a Roman temple, a large theater (the first one in Israel according to Netzer), a stadium/hippodrome, public baths and according to Josephus several palaces. There was plenty of water for the city brought by an aqueduct. To date, only a small percentage of the city has been excavated. In Josephus there is a detailed description of Herod’s palace, preceding even the harbor which was an exceptional feat of engineering and probably a great source of pride to Herod. 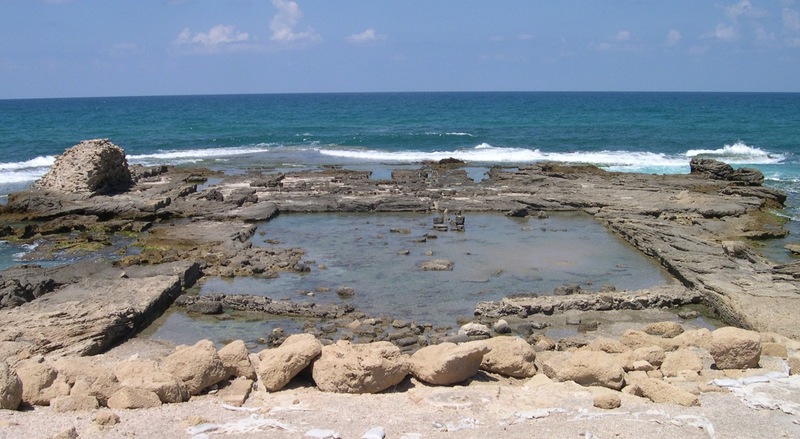 Its location on a promontory jutting 100 meters out into the sea makes it unique and the placement of a pool in the center (where one would expect to find an internal courtyard) shows Herod’s exceptional building style. The other two natural promontories at Caesarea were used to anchor the harbor. All of the pool is hewn into the kurkar sandstone bedrock, coated with hydraulic plaster and from the outset was filled with fresh water and was intended for swimming and bathing. Evidence that pozzolana cement was used in the construction of features of the pool is further evidence that it was constructed at the same time as the harbor. Some scholars regarded the pool as a fishpond and the entire structure a piscine, or fish market of sorts based on a network of open channels, intermediate pools and sluices linking the pool with the sea but according to Netzer this was at a later stage, 600 years after Herod when the pool was put to secondary use. Many fallen drums, pedestals and capitals were found at the bottom of the pool presumably from rows of columns that framed a peristyle courtyard. The pool is bordered on the east by the triclinium (formal dining room) and on the west by additional rooms closer to the sea (see layouts of the palace). The floors of the triclinium and smaller rooms on each side had elaborate, geometric mosaic floors. Caesarea was battered by a strong storm in December 2010 (see Haaretz article) and 1000 year old artifacts were swept into the sea and lost forever (on my recent visit to the park I saw Park Authority staff working to cleanup the damage to the palace). Additional excavations in 1976 followed the development of the east wing during the Roman period. Beside the triclinium was added a small caldarium, whose hypocaust and furnace were well preserved. One of the tiles of the furnace has the stamp of the Legion X Fretensis. Excavators found two inscribed marble columns with six dedicatory inscriptions that reveal important new information about officials of Caesarea from the 2nd-4th C CE. Besides the architecture there is also the human drama. Josephus describes many incidents in peoples lives that happened in Herod’s palace. Agrippa I died in the palace after opening the Games and blaspheming in the stadium (Acts 12:20-23). A hall in the Upper Palace was the destination of the apostle Paul for a hearing before Antoninus Felix (Acts 23:35.). Later, Herod Agrippa II and his sister Berenike visited a new governor, Porcius Festus, and heard Paul’s self-defense there (Acts 25:23). Josephus relates a demonstration outside of the palace demanding the removal of Roman standards with the images of humans and animals from Jerusalem. Pilate had the Jews held in the stadium and threatened to kill them but backed down. In fact, the only archaeological evidence that Pilate existed is a dedicatory inscription with the name Pilatus that was found here (there is a copy at the site, the original is on display at the Israel Museum). Walking through the hippodrome don’t miss the mosaic floor with images of birds, animals and people from a public building near the bath house. 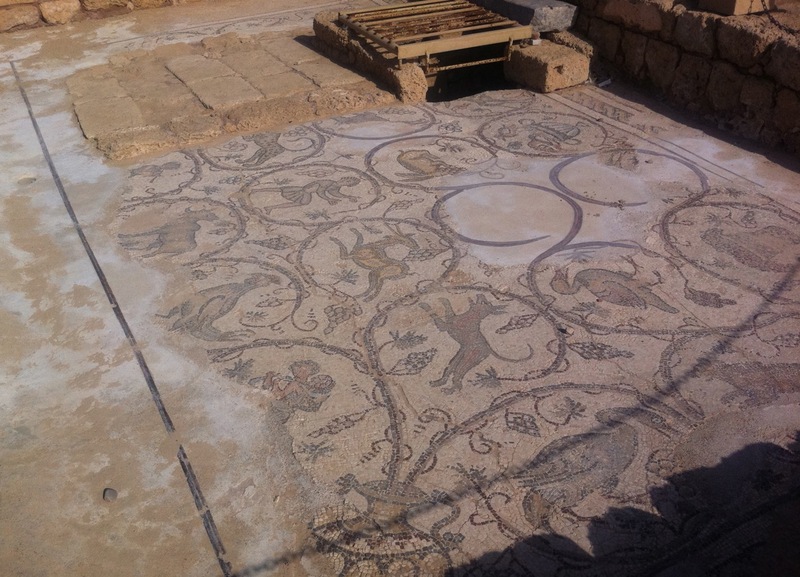 Interesting to compare it with the Bird mosaic from a 6th C mansion/palace nearby. This entry was posted in Archaeology, Architecture, Mosaics, Synagogue, Travel and tagged Caesarea, Herod palace, King Herod, mosaic, mosaic floor, Pilate, postaweek2011 on January 3, 2011 by Shmuel Browns. Wonderful post!! So well documented with links and reference. I really enjoyed this and want to go there right now!